I’ve run this story before but it’s worth getting as much publicity for it as we can. If people decide not to get involved, they should do so for good reasons, not just because they didn’t know about the scheme. The BHAF in collaboration with the council have set up a way of donating to a ring-fenced fund for allotments. The idea is that people who are maybe a little better off voluntarily give money over and above their rent to the council to enable (perhaps) those who find it harder to pay their rent to manage. It’s a kind of self-administered means-testing, and it is simply a brilliant idea. I’m still in two minds about it, though. It’s needed because the council has determined the allotments should be cost-neutral – that the take in rents equals the cost of providing the service. That’s a political decision, not a financial one; there’s no difference between that and a future council saying (for example) that the rents should be commercially competitive, and they should be able to make a profit from them as if they were renting to property developers. On the other hand, BHAF quote the true fact that councils do have a finite and shrinking budget, and that essential services are being cut. People are suffering, and those of us who have allotments and find it relatively easy to pay the rent are taking resources from schools, police, libraries, bin collections and roads. Allotments are excellent value, and if we can afford to pay, we should. Another issue is the “ring-fencing”. This will of course be rigorously implemented, but may not mean what you think. It won’t mean, for example, that the allotment service will have more money from the donations, because as they increase, the funds diverted from other services – many of which, as I’ve said, are more essential – will also be cut, possibly after a short delay. That’s not a bad thing, but I wouldn’t say it’s a good thing. The current committee at BHAF are excellent, dedicated, and honourable people, and if they recommend something like this, that says a lot. If you do want to donate, you should have received a how-to with your invoice in October (I’ll also include it in a post here soon). 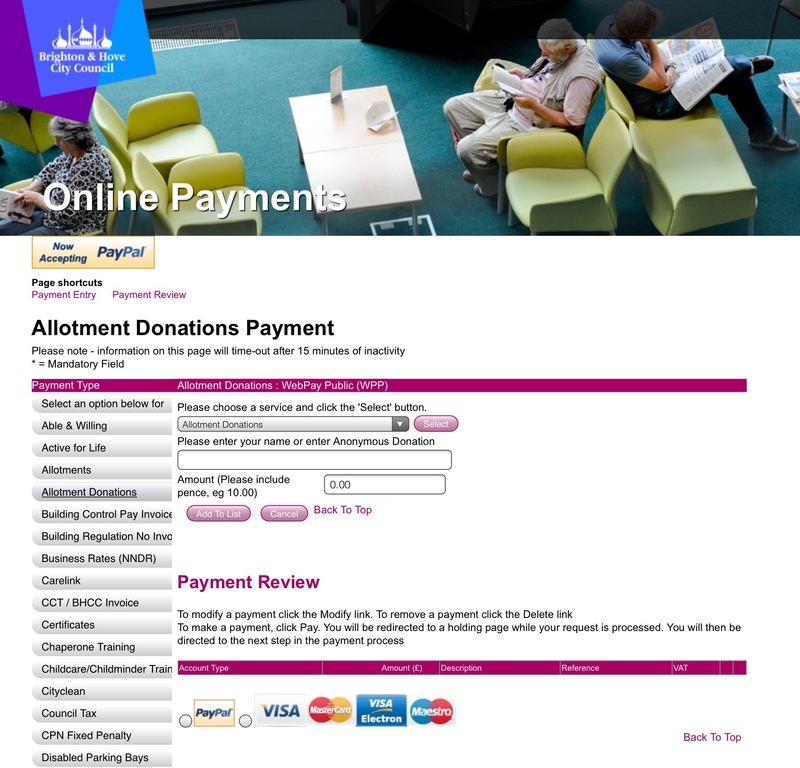 Probably the best way to pay – because less likely to be misallocated – is to go to the council website, click “pay online”, and select the payment type “Allotment Donation”. Then pay by card or PayPal. This form of payment (called webpay public) will allocate the donation automatically, and you can pay anonymously. Other ways of paying are available – details on the how-to.